Oh FOMO. What is FOMO you ask? Well I had to consult "the Google" after hearing FOMO on a reality tv show (yes, I’ve been known to watch a Real Housewives now and then) and having no idea what the heck they were talking about. Urban Dictionary told me that FOMO is the Fear of Missing Out. Suddenly it all made sense. And I started to notice when FOMO reared its ugly head in my life. Most recently it popped up while helping facilitate an out-of-town weekend workshop. All weekend I couldn’t find my social groove and found myself standing in the middle of the conference room, alone. I was alone because I feared missing out on any and every conversation! I wanted to connect with the yoga crunchy folks but didn’t feel earthy or hip enough BUT I really wanted to chat with them because I didn’t want to miss out on the details of their upcoming awesome yoga and nature retreats. I wanted to connect with the super fit moms to find out how they looked so amazing while homeschooling their kids while their husbands traveled for work. But, I was there in a non-Mom role and didn’t want to get caught in kid-only conversations BUT I didn’t want to miss out on their tips and secrets! I wanted to chat with the wise ones BUT was afraid that while I was getting pearls of wisdom dropped on me I’d miss out in the crunchy hipsters and hot mom conversations. When I realized that I was in the middle of the room alone, missing out on everything, I followed these steps to snap me out of FOMO and into the moment (which will hereafter be known as MOMO...sounds way better, right?!). First, I took a deep breath. We know that deep breathing switches us into the parasympathetic mode. Once we are out of the stress mode (sympathetic), we can think more clearly because our cognitive and physiological functions aren't focused on survival...helpful when being chased by a tiger or a bad guy but not so much when I'm trying to figure out how to navigate a harmless social situation. Second, with a quieter mind, I asked myself what I really wanted. This pulled me out of my head and back into my true nature. I’m an introvert, and what I really wanted was to talk to the one super cool other introvert Mom from one of my favorite cities. Third, I acted. I got out of my head and the endless "...BUT...What if..." and I walked over to the cool introvert Mom, and before I knew it we were engrossed in a conversation about travel and food...two of my favorite things. Lastly, I let it all go...I let go of the judgment and self criticism. I let go of the idea that I didn’t belong, and I embraced being me...quirks and all. These steps are particularly important at this time of year when holiday social obligations and choices are on overdrive. There are many parties and gatherings that you could attend. Choose quality over quantity, especially if you are an introvert. Instead of trying to talk to everyone at a neighborhood party or fearing not getting enough face time with your boss to tell her about your brilliant idea and subsequent need for a promotion at the Office holiday happy hour, breathe, be you, choose something you want to do or someone you want to talk to, and don’t look back! 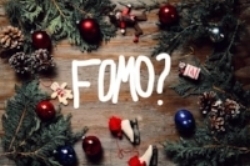 Have you had a FOMO experience (even if you didn’t know the catchy term)?! If so, what steps worked to get you out of FOMO and into the MOMO (look for MOMO coming to an urban dictionary near you! )?